I spent a lot of time today thinking about my community – not just my tribe, but the community that we live in. When we moved back I was very mindful about the fact that I wanted to make Cochrane our hometown. It has always been a community I have felt part of, even though we have always lived on the outside of it. With that in mind, we started building relationships with the people in town – making new friends (reacquainting with old ones), getting to know the people who work in the shops we frequent – the grocery store, the cafes, the pet store – developing a church community (still a work in progress). Every time we go into town we see people we know. For the kids and I who were strangers and foreigners for years, that is a really big deal. It means we are home, we have a place where we belong – there’s a lot of security and joy that comes from that. Then we also have the blessing of our big and crazy tribe. People get added to it and it grows, but the sense of peace that comes from it stays the same. Jenna has developed a strong friendship with a delightful girl from her school. It has begun a friendship with her mother and I. I think those kinds of friendships are the best – where the whole family develops a bond. 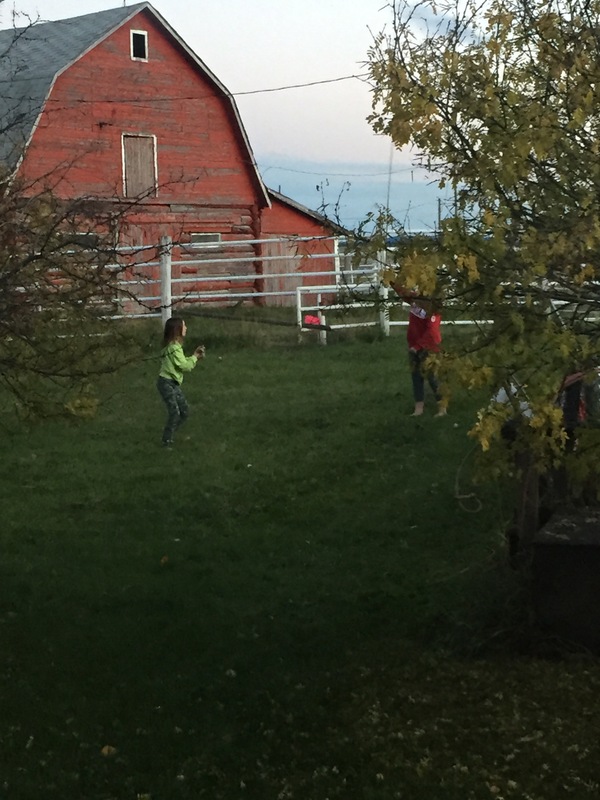 The two girls are in the yard playing Star Wars with bamboo sticks. My favourite view from my house is the one out the kitchen window towards the barn. Usually it’s because I love the barn, I love the animals that usually are out there, but mostly it’s because that view gives me the feeling of home. When I looked out and saw them playing there I realized how much this has become home for the kids too. Happiness moment extrordinaire.